This popular Thai dish has many English spellings: Pad Kra Pao, Pad Ka Prao, Pad Ka Pow, Pad Krapow…etc. “Pad gaprao” is the phonetically closest spelling, but it seems to be the least popular way because most Thai people mispronounce it to begin with! 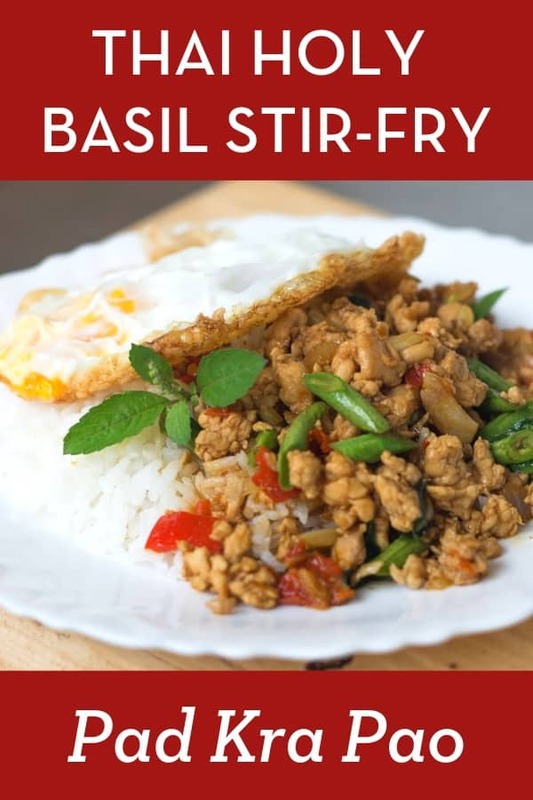 Doesn’t matter, because no matter how you spell it, they all point to this same delicious, rustic, spicy stir-fry featuring the aroma of holy basil. For a truly classic way to serve this dish, pour it over rice and top with a fried egg! In Thailand, this dish might be considered the equivalent of a sandwich or a burger. Something quick, easy, and ubiquitous that lots of people have for lunch. You can find pad gaprao at a simple street-side restaurant or in a food court, and many people have it for lunch. Sometimes vendors will make it fresh for you, other times, you can find it premade in a big tray and they just scoop it up and pour it over hot rice. You can have this dish on its own with rice, but the most popular way is to have it with a fried egg. This classic combination is called “kao pad gaprao gai kai dao”, which simply means rice with chicken holy basil stir-fry and a fried egg. Thai fried egg is fried in a LOT of oil because the key characteristic you want is that bubbly browned edges of the egg whites. The creaminess of the slightly runny egg mellows out the strong, spicy flavour of the stir-fry, and that’s why it’s such a winning combo. Although this recipe is most popular with chicken, you can make it with just about every kind of protein imaginable. Pork, beef, seafood, or even vegetarian version made with tofu and/or mushrooms. So if chicken isn’t your thing, feel free to change it up! I use ground meat in this recipe because it’s the most classic and the most “street” way you’ll find pad kra pao, but you can use thinly sliced pieces of meat instead. Although, I REALLY think it tastes better with ground meat, so give it a go! Prik Nam Pla (condiment for seasoning the egg, optional): Mix together some fish sauce, a squeeze of lime juice, chopped Thai chilies, and chopped garlic. Note: If you don’t have holy basil, Thai basil will work fine; however, I have found that regular Italian basil actually has a more similar flavour to holy basil than Thai basil does, so that will work as well! 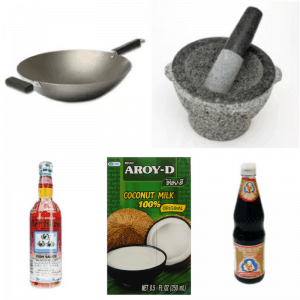 Tools needed: A wok or a large skillet for the stir-fry. For the fried egg you can use a wok or a small frying pan, and non-stick would be better so you don’t have to worry about the egg sticking. Pound Thai chilies into a fine paste. Add garlic and spur chilies and pound into a rough paste. Combine oyster sauce, soy sauce, fish sauce, black soy sauce, water and sugar; stir to dissolve the sugar. 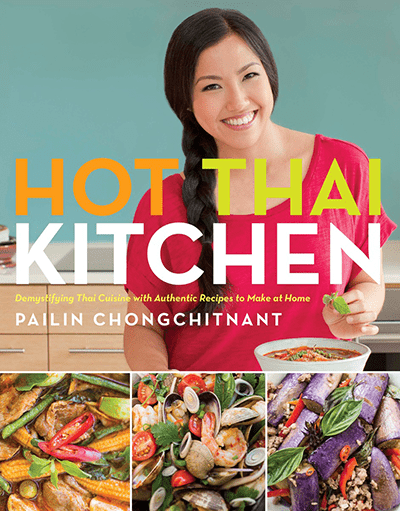 In a wok or a large saute pan, saute the garlic-chili paste in a little vegetable oil over medium high heat until the garlic starts to turn golden. Add chicken and toss until they’re no longer in big clumps. Add the sauce and continue tossing until the chicken is almost done. Add onions and long beans; toss until the chicken is done. Remove from heat and stir in the holy basil. Heat about 1 cm of vegetable oil in a small non-stick pan or a wok over medium high heat. Once the oil is hot (you want the oil very hot, especially if you like runny yolk), crack the egg directly into the pan and let it fry until the edges are browned and bubbly. Serve the stir-fry over rice and top it with the fried egg. Drizzle a little of the prik nam pla over the egg and enjoy!